The Regional Transit Authority of Southeast Michigan seeks the community’s Input on its New Regional Transit Vision. During meetings throughout the state, the RTA hopes to gather feedback on the Proposed Connect Southeast Michigan Plan. A meeting will be held in Birmingham tomorrow. Questions? Call 313-402-1020 or email info@rtamichigan.org. 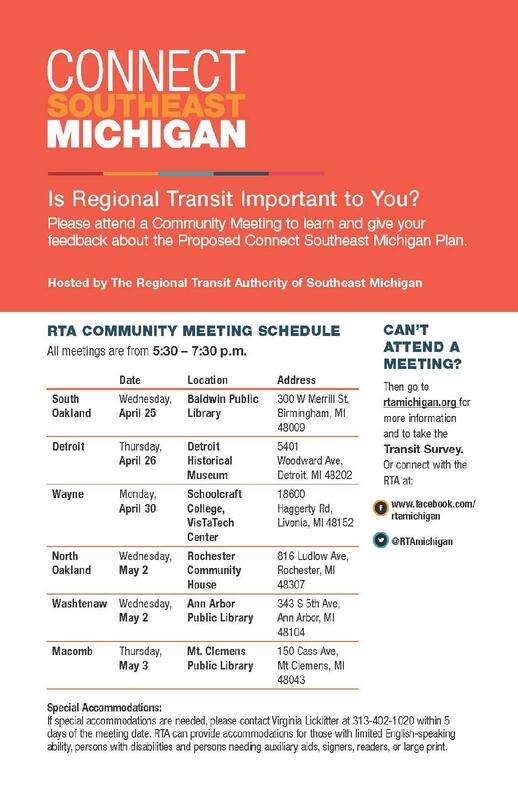 On April 19, The Regional Transit Authority of Southeast Michigan (RTA) announced plans to engage Southeast Michigan residents to gather their feedback and opinions to move regional transit forward. Through a series of six community meetings across southeast Michigan and an online survey, the RTA is inviting the public to provide feedback on the Proposed Connect Southeast Michigan Plan. The four-part vision is available online, with a map available here. Please see the list of 6 public meetings. We would welcome your attendance and appreciate your sharing this information with your constituents so that they can learn about the Proposed Connect Southeast Michigan Plan and share their views.